I have mentioned in profiles of other pens a strange competition which seemed to exist in the first part of the 20th century to attempt very small pens. The champion of this strange miniaturization effort appear to be the Salz Bros. with the Peter Pan, which is by far the smallest functional fountain pen I’ve had anything to do with. The name, of course, is clearly derived from the J.M. Barrie character of the same name. One suspects that this was an unlicensed use of the name, but what is more surprising than the failure of Barrie to have Salz Bros. sued silly is that it took as long as it did for some pen-maker to latch onto the name. The character, or rather the play he appears in, was first staged in 1904, was sufficiently popular to be novelized in 1911, and has hardly been out of the public eye since. It may be that Salz Bros. were influenced by a 1924 Broadway opening of the play, but this hardly explains the lapse in their fellow pen makers, many of whom were interested in both tiny expressions of the product and shameless promotional gimmickry. It can hardly be the case that Salz Bros. was the first company with the technical competence to make a pen like this, since its initial form was a very simple eyedropper-filled type that any maker could easily manage, and they had been in the business far less time than many highly respected makers who could certainly have cut as small a feed and forged as wee a point. However it came to be, the Peter Pan is an interesting example of pushing an envelope. Apart from the simple difficulty of working on that scale, physics also starts to turn from ally to enemy with a pen than small. The most notable problem with my exemplar is that the inner diameter of the barrel is so small that surface tension can keep the ink suspended in it against gravity. This was probably less of a problem in the more hygroscopically-inclined hard rubber versions, and similarly in the sacked lever-fillers, but it hints at some edge-of-possibility behaviours going on in the feed. The size of the pen also makes it rather tricky to use. Even posted, it’s a mere little stub, and while the point is smooth and willing, the general experience of writing with the pen for any but the most tiny people is necessarily taxing. Add to the difficulty of directing it an ongoing worry of either gripping it more tightly than it can stand, or of not gripping it tightly enough and seeing it drop between the floor-boards, and it’s a slightly harrowing pen to carry. The late models are a lot bigger, relatively speaking, to allow for an internal filling mechanism, and are thus a little more practical as writing instruments. Production Run: c. 1920 – c. 1940. Cost When New: Not a lot, although I’ve yet to find a hard price. Size: 5.8 cm long capped, 8.2 cm posted, 5.2 cm uncapped for my mid-run example. The late lever-fillers were as big as 8.9 cm capped, 10.5 cm posted. Body: Earliest versions were hard rubber, switching to celluloid. Filler: Eyedropper in the earlier part of the run; my mid-run model’s capacity is approx. 0.4 ml. Later versions were lever fillers, probably of similar capacity. Salz Bros. Peter Pan; this example is a celluloid-bodied eyedropper. Because even the measurements don’t really put a context to the size (or lack thereof) of this pen, here it is lying next to an international short cartridge. 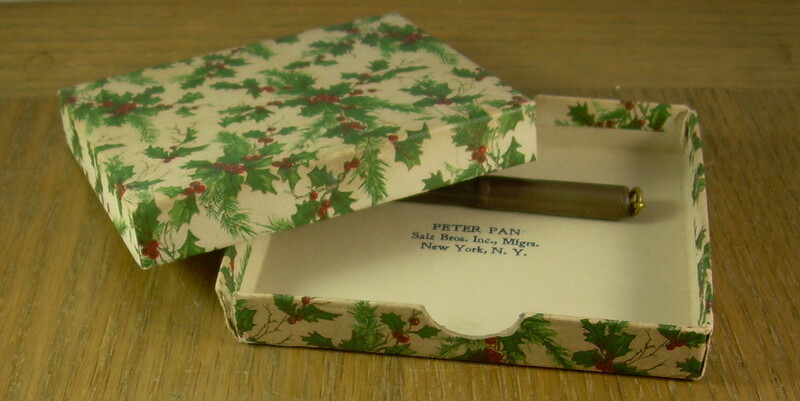 Any time I’ve seen a box for a Peter Pan, it has a Christmas theme; one suspects this pen was seasonally marketed.